Just before we left to adopt Ethan and Anna, on July 27th, I sang and spoke on the morning services at Bethel Presbyterian. This was to update them on Noah (this church was incredibly supportive of our adoption of Noah, hosting a benefit concert and just being incredibly faithful and lovely to us in prayer and support), and also to tell them about Ethan and Anna and have a time of prayer for that. I just love them – what a faithful, wonderful group of people! I also introduced my new song “Nothing to Fear” doing an acoustic version, and telling them that we were working on the new album. 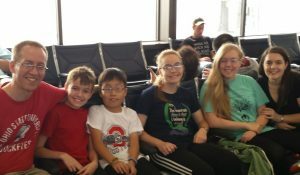 July 27th, bright and early, we left for China, meeting Ethan and Anna on July 31st and adopting them on Aug 1st. It took a couple weeks to finish all the paperwork, and we returned home on August 12th. 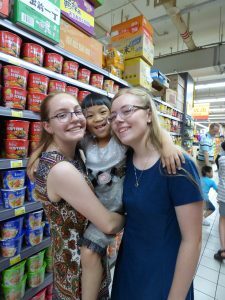 If you’d like to read about our adoption trip, you’ll find the first post here. The next two months were a blur of adjustment, starting school, learning English, and medical appointments. On Oct 18-21 I went to Nashville to record all the vocals for the new album and do the photoshoot for the packaging. 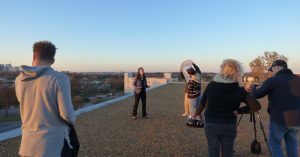 On Nov 17-19 I went back to Nashville to shoot the majority of the footage for four music videos, a pretty insane weekend and shoot schedule! The following weekend I drove to the middle of Pennsylvania to do Christmas events at Roxbury Camp. Their event has grown so much in the past years that they can’t fit everyone, so they do two identical, back-to-back events. I got to stay at the camp, and just can’t tell you how much I appreciated the camp staff! They were just the kindest, most lovely people! 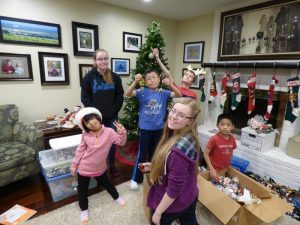 And the program director was a missionary kid in the Philippines growing up and decided he wanted to throw a staff party on the night between the events just to bless the staff and us. He made all Filipino food and taught me how to make lumpia, basically a Filipino spring roll, and they were great! We made so many, he sent some home with me, and the kids just cleaned those up! 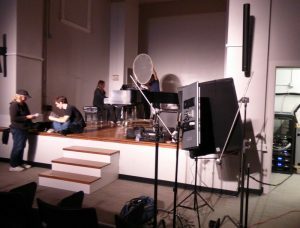 On Dec. 17th, I went back to the church I served as music director for over twelve years. It was their 40th anniversary year, and they invited people back to do a retrospective. It was so lovely to catch up with everyone, and I sat in with the worship band and spoke and sang some too. On Feb 25th I spoke and sang at the worship services for Grace Polaris Church in Columbus. This is the church that did my assistant, Donna’s, funeral, so they have a special place in my heart! And I did the services to help promote the women’s conference I gave there on March 2-3rd. 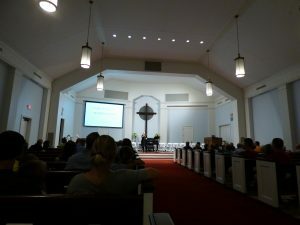 I did a concert/testimony time on Friday night, and then Saturday did a one-day conference on Esther. 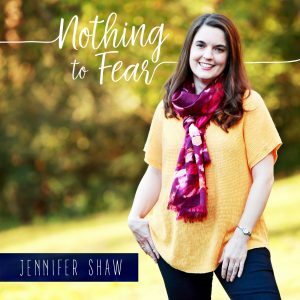 Sadly, the women’s ministry director (who is lovely!) lost her mom that very week and was unable to be there, and I just appreciated how her team pulled together and did a wonderful job even without her there. March 4th I was the guest worship leader at Karl Rd. Baptist and also did a few songs from the new album. I always love being here – this church is absolutely outstanding in serving their local community and I love the diversity here too which totally reflects their neighborhood. It’s a picture of heaven to me! 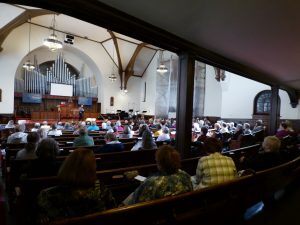 On March 11th I sang at all the morning services for St. Luke’s in Gahanna, OH. This is also a special church with a great heart for outreach! 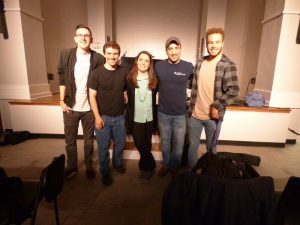 I just love being with them, and did a full concert for the new album later that month on March 21th. 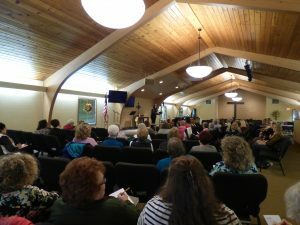 On March 16th and 17th I did the regional women’s retreats for the Nazarene denomination at Mount Vernon Nazarene University. This was a beautiful facility and a great team, so we decided to bring in my video guy, Jeff, and film it too. I spoke on the life of Peter, one of my favorite topics! 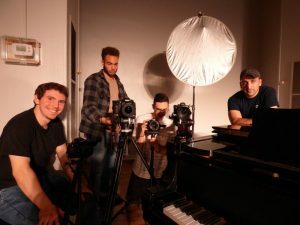 The next day, since we knew we had Jeff in town, we did another cray-cray day of filming, getting additional footage for two of the music videos that needed it. We hit about 5 locations and still got Jeff to his plane with minutes to spare. That was nuts, but I’m so glad we got it done! 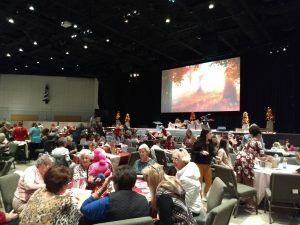 March 24th I did a one day women’s retreat on Esther at Fulton Creek Friends Church. I was with them last year too, and just love their heart for special needs families. And as an amazingly sweet surprise, they had two girls scheduled to do a dance to my song “Your Child” that they had planned even before they knew I was their speaker! April 13th and 20th I did benefit events for Remember Nhu in Indianapolis and Cleveland. Remember Nhu is the organization we went to Thailand with several years ago, and I wrote the song “To Be Love” for them. They fight child trafficking, and just do great work. I am so excited to see how fast they are growing and how God is blessing their very needed ministry, even as I am so sad that their ministry is necessary. It’s a privilege to help their mission. April 21st I sang for a “last roll call” service for the Veterans Association here in Columbus. It was a memorial service for the more than 600 service men and women lost in the last quarter. That was a hard event to do, but again, just a privilege to be asked. Then on June 17th I was at Living Waters Lutheran Church in NJ. This is my aunt and uncle’s church and we were visiting after my daughter Rachel played at Carnegie Hall with her youth orchestra. They really touched my heart with their support for our Compassion kiddos at that church! Now I have a bit of a break until later in the summer. Anna had to have some pretty major surgery, and I didn’t want to schedule things without knowing how it would go. 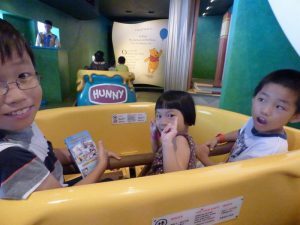 First time on Winnie the Pooh – their eyes were huge! Loved sitting behind them. 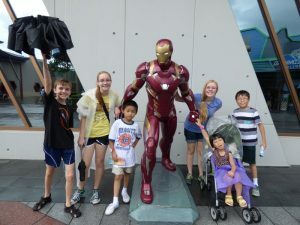 Ethan thought Iron Man was the best thing ever!! Really fun ride. Who cares if it’s 105 degrees when your Dad is giving you a ride? 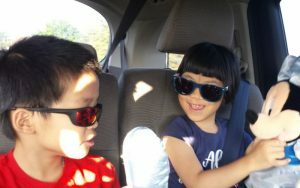 Headed to the international clinic for their 5 hour appointment and thinking they are looking pretty hip in their sunglasses. First s’mores – they were skeptical and then they were in love. First days at school. Math is comforting because the numbers don’t change. 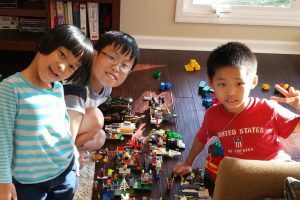 Some of their amazing early Lego creations. First time in a tree – they thought it was amazing and just a little scary. Anna brought this home and made my week – we have come so far from those tough, tough days in China. Tons of fun with Rinnah at college! Rinnah the birthday girl with all her sibs. Ethan learned to ride the bike by himself in 8 minutes!! 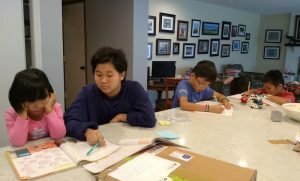 Working hard with our Chinese tutor, Angie, on our Chinese school homework. Anna the birthday girl with my mom. Ethan the birthday boy with Nathan and being photobombed by his brother, Toby. 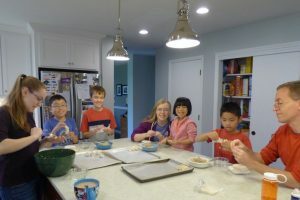 Family dumpling party on Thanksgiving morning. 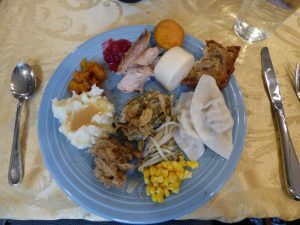 Our cross-cultural Thanksgiving dinner – turkey, steamed sweet potatoes, steamed buns, apple bread, pork dumplings, bean sprouts, corn, stuffing, mashed potatoes, butternut squash, cranberry sauce, and the requisite green bean casserole smack in the middle. Christmas decorating for the first time. Caught a family shot, a very rare opportunity! It’s safe to say that I don’t remember a time in the last decade that I have been this overwhelmed with all that is happening. So much of it good, quite a lot of it hard, and we are getting to place where I can see the light at the end of the tunnel. I’m sad I wasn’t able to keep up with my blog as I wished I had a better record of these first few months, but there simply hasn’t been time. Putting some thoughts, some FB posts, and a lot of pictures here just to record what has happened. My last post we were heading to Hong Kong on our last stop before bringing our new children home. We added this extra day just to show them Disney at Noah’s request – he had loved going there on his way home and wanted to share it. We took the speed train there, and then two subways which we somehow managed to change without losing any baggage or children – we each had a death grip on someone, and I swear my heart rate didn’t return to normal until we were off the subway an hour. We were exhausted and then waited another hour for a bus that refused to allow us to board with our luggage and a driver who was incredibly mean about it – not our favorite memory of Hong Kong. We finally split up to take two taxis which was also nerve wracking but we all made it and checked into our last hotel. We spent the next day at Disney and it was a fun day. The kids have never seen anything like it, and you would expect them to be so excited, but they were more nervous. However, after the first couple of rides, they were starting to warm up, and after the Iron Man ride for Ethan (he got off yelling, “again, again, again!”) and It’s a Small World for Anna (who literally danced in line the entire time we waited she was so excited) the tide turned, and we really had fun the rest of the day. We went back to the hotel and packed up for the long plane ride home. We got to Newark fine, and the kids did remarkably well for their first plane ride ever, especially considering it was 16 hours long! We had seats together in the center all the way in the back of the place, but at least we were together which was a massive improvement over our flight in. I was in a row with Ethan and Noah, and Nathan sat behind me with Toby and Anna, and Rinnah and Rachel were in the third row with one poor lady who got stuck in the middle of our family. Everyone slept a little, ate a little (why is airplane food so bad?! Why? Why?!) and we made it. 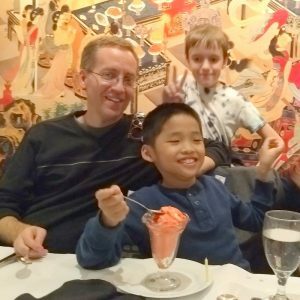 Immigration was different here than when we were in Dallas with Noah – they separated me and the new kids and sent us to a “special office” with no info on where we were going or how long it would take which made everyone nervous. But we were the only ones in there and it took less than 15 minutes to process Ethan and Anna as the newest citizens of the US. We joined the rest of the family who had been waiting out in the terminal and headed for our flight home. Sadly, we were delayed several times, but we did eventually get out. Some of the people who had planned to meet us weren’t able to because it was so late, but a few stalwart friends stuck it out for us and it was so good to see them and be home! This was a really hard trip. When we went to get Noah, it was hard, and he was scared and grieving and we were scared and trying to figure out how to help him, etc, but he’d also been well prepared, and we had no issues with the adoption or anything. We really had a very smooth trip, and a lot of time to sight-see and enjoy things and he was in a place to be able to do that and it felt really bonding overall for our family. This trip felt like the whole adoption process had before it – more of a fight. It was so hot, the things with Anna were so emotionally difficult, we had problems with multiple parts of the process that were very frightening and exhausting, and it was just incredibly stressful. I am so grateful it’s over. Honestly, I feel a little like I have PTSD from the process, and I’m not sure why it has to be so hard. I mean, some parts of it are just going to be hard, there’s no getting around it, but it seems like we had so many hard things that don’t need to be that way. And it makes me sad for the kiddos who are not going to adopted because they’ve made the process so difficult. I don’t really want to talk to any government entities for a while. There’s a whole year still at least of paperwork before we’re truly done with everything, but at least the big stuff is over, they are here, and they are ours. The week after we got home we had to hit the ground running. Toby started middle school literally a day and a half after getting home. Noah and Rachel started two days later. Rinnah left to start college a week after that (talk about a one-two punch for mom emotionally). 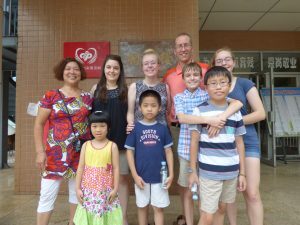 And Ethan and Anna had their big appointments at the international clinic and the dentist and Anna had a huge intake for the cleft team at the hospital, all while we were dealing with pretty crushing jet lag. I felt sick for about two weeks! But somehow we got through it all. I’ve been struggling with being mad at our agency – if we hadn’t had all the setbacks with wrong info, etc, we would have been home many weeks earlier and not had this crazy transition. 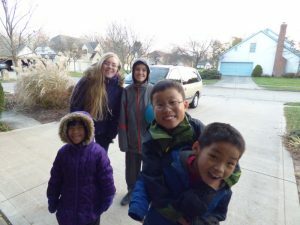 We also realized that we were going to have to send Ethan and Anna to school pretty quickly if we wanted to be able to go with them and help them – Nathan had to go back to work, and there was no way for me to be two places at once. Nathan actually put off going back to work an extra week because we couldn’t figure out any other way to transition them. He ended up going with Ethan and I went with Anna for a week and a half, and then I did a half day with each of them for another week and a half or so. American school is just light years different from Chinese school, not to mention that neither of them spoke English, so that was really important. The first day I only took Anna for half a day, and when we left, she cried. I thought it was the stress, but it turned out, she was having fun and didn’t want to leave! Even though that was much earlier than I thought we’d send them and there were definitely ups and downs, they both really love school and I’m so glad we were able to get it done the way we wanted to. And shout out to our school – they have again just bent over backwards to help us do whatever we needed to to help the kids feel safe and comfortable, and that is definitely not always the response of schools. We also had to start the kids almost immediately in Chinese school just because of how the semesters run. We were afraid if we waited, Anna especially would just lose too much. It’s very important to us that the kids maintain their language. It’s such a gift to be bi-lingual, and also such an important part of their history, culture, and identity. And when we take them back to China someday, we’d really like them to be able to talk to the foster parents if we are able to visit them! So, by one month home, we had a pretty good handle on the new kids’ medical situations, they were transitioned into school and doing pretty well, and they both knew all the Chinese words we knew and had picked up enough English that we were limping along pretty well as far as communication goes. It has been an incredible blessing to have Noah able to translate when things were hard – he doesn’t like to do it as it’s stressful for him, so we try not to ask much, but he’s a real trooper about it and I’ve been so proud of him and his desire to be a good big brother, something he was intimidated by. We’ve also come a long way with our relationships. Anna’s and mine started off really rocky, but she is very attached to me now. 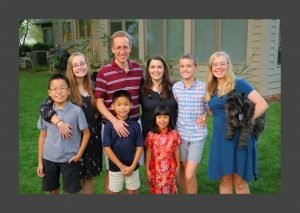 As she’s gotten more language, she’s also expressing a lot of sadness about China and missing her foster family there (it is not like foster care in the US, they would not have been allowed to adopt her) and I am so glad we are still in contact with her family. 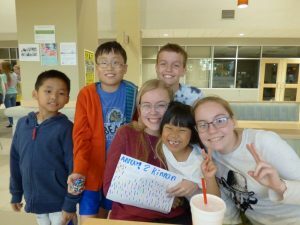 They love her very much and are always happy to hear how she is doing, and it’s very comforting for her to know that we know how to find them and that they are happy she has a permanent family with us. We try to be open to talk about anything, and I really stress that it is fine for her to love both of us and that we also really appreciate and care about her foster family. Ethan has been slower to warm up to me – he loves, loves, loves Nathan! So, while it’s not that he doesn’t like me, I think he just wanted all Nathan at first. He was so excited to have a dad! But I am so happy that he really has been opening up, and we’re doing well now. He’s much more guarded in his feelings, and keeps things to himself, so it’s a privilege when he shares himself with you. He’s started being more open to affection and expressing himself more, and I’m just really looking forward to getting to know him. We love them both so much already. In October we went to Taylor to visit Rinnah for her birthday. It was so good to see her! I’ve really been struggling with her leaving for school – I love her dearly and have missed her so much. She’s been really homesick too, especially with the new kiddos here, and it’s been hard to hear her sad. But that is also turning around as she makes friends, and I do think her school is a perfect fit for her. 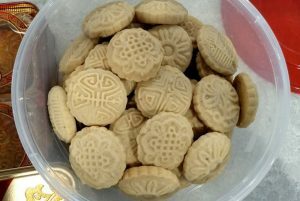 We also celebrated Moon Festival with her while we were there, and brought moon cakes and made moon cookies, etc. 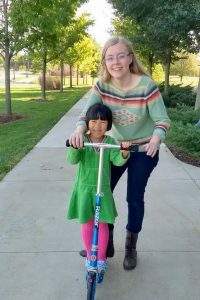 The kids all brought their scooters and we trekked all over campus – it was so fun! 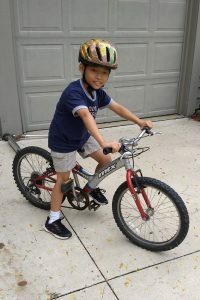 We also had Toby’s birthday and Noah’s birthday and Ethan taught himself to ride a bike in eight minutes (no joke!). 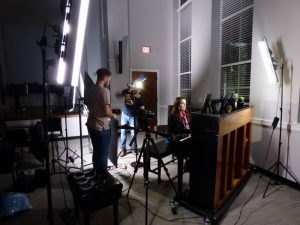 I also headed to Nashville for my first time away to record the vocals for my new album – I’ll write about that in a separate post. 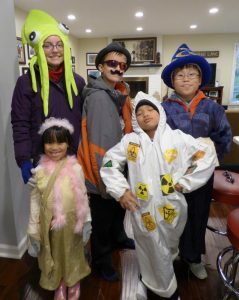 We also tried to explain Halloween and had our first trick or treat. Me: Yes, you wear your princess dress. Me: We will bring a pillowcase for the candy. Yes, they put candy in the pillowcase. Me: Yep. You got it! 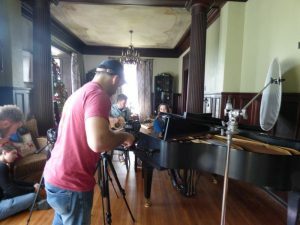 Finally, in November I headed back to Nashville to shoot music videos for the new album, we had Anna’s birthday and Ethan’s birthday just days apart, and we celebrated a very Chinese and American Thanksgiving. The kids both struggled a lot with anxiety just before their birthdays, just like Noah did last year. Because they’ve never had a birthday celebration, it’s like they have this intense worry that what if it isn’t the way they dreamed it would be? Or what if we forget them or don’t celebrate them the way we do every other family member? It’s was pretty intense leading up to the days, but getting through it helped so much. We had some massive behind-the-scenes drama getting Ethan’s presents that he never knew about (long God story, but He sure showed up and so did my family!) and it was just amazing to watch Ethan realize that yes, he was going to have a birthday celebration just like everyone else. These are the things that build trust and bond the family and make the kids realize that they do belong here and they are loved. So, this has been one of the most challenging seasons I’ve been through for so many reasons. One, emotionally it’s just been tough. The kids are grieving and anxious and don’t know how things will be or work, so that is all hands on deck all the time. The time pressure has also been intense. There’s so much more work just with the fact of six kids, and also with the new album. Getting them into school and praying and hoping that they will be comfortable and accepted there, and just the work that needed to happen to get them settled. Sitting with the kids every night for an hour until they fall asleep because they are still so scared at night and in the dark. Making sure we have food they will eat so we have one less stress for them. The adjustment by our whole family to two new people, personalities, problems with communication, all of it. It’s been hard, and I feel like we’ve climbed a mountain. But with that said, I feel like the worst of it is behind us. We have adjusted. They are getting more English every day. They are genuinely happy at school and have made good friends. They have learned to like many foods here. They are connecting and attaching to our family and we love them. Now we are looking forward to Anna’s foster sister, Quinn, being adopted by our friends the Moses’ in January. We can’t wait to meet her and reunite the girls! We are looking forward to Ethan and Anna’s first Christmas and sharing the truth of Jesus with them. We are looking forward to having Rinnah home for several weeks of school break. And we are just looking forward to more normalcy and having some time just to be a family and solidify those bonds! 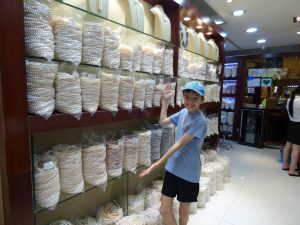 Toby at the pearl market – so bizarre to see these walls with giant bags of pearls just sitting out – crazy! 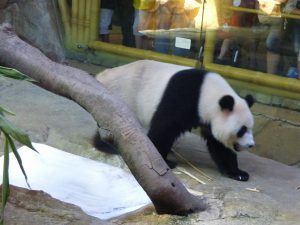 Pandas were on the move today, even in the heat! 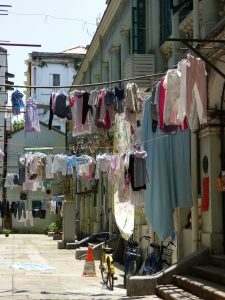 Sunday morning I went with the girls and Toby to the pearl market and Shamian Island. This was something our guide had arranged for all of us, but since last night was late and Ethan was struggling (and Nathan has zero interest in shopping!) we decided he would stay home with the younger three and have a very chill morning, and I would take the other kids to buy their souvenirs for their friends. I’m so glad that other kids didn’t come, because this really was just hours of shopping, and most of it very touristy. We didn’t get a lot, but the kids did find the little things they were looking for, and I got Ethan a small carved dragon (his Chinese name means dragon) and Anna a little jade necklace as a keepsake. Then we headed home and they went back to the pool. Neither of them show any fear at all. That in itself is a little scary – they have no sense of danger. I think they will both be swimming before we know it, as long as we can keep them alive long enough for them to learn to swim! That night Nathan and I ran out to get takeout for dinner and have another pj evening. We hit the bakery for bread, the fruit store for (you guessed it!) fruit, and the 7-11 for water and yogurt for breakfast, and then went to our go-to place this trip, Noodles, the restaurant nearest our hotel. We ran into Molly, our guide from our trip with Noah and I was so glad to see her! We had loved her last time and wanted to have her again, but she was out of town our first week. She immediately asked after Noah, and I invited her to stop by and see him, and she did! It was so sweet. But more than that, I think God arranged it. This whole time since our visit to Anna’s orphanage and the horror of my taking her away from her foster mother, Anna has pretty much shunned me. It’s been very hard on my heart. I have seen little cracks where she’ll sort of forget she’s mad at me and smile or something, but then she’ll remember and just shut me down. She’ll draw a picture and show it to Rinnah and Rachel and Baba very excitedly, and then pointedly stare me down and hold it behind her, absolutely letting me know that she doesn’t want to show me. It’s been hard. Well, Molly ended up talking to Anna for over half an hour. Anna told Molly she doesn’t need me, she already has a mom (talking about her foster mother). And Molly said, “Yes, you have a China mom who will always love you and her job was to take good care of you until your forever mom came. And now this mom is your forever mom! She will always love you and take care of you for the rest of your life! You can always love your China mom, but you can love this mom too because she will always be your mom. She is your forever mom!” It was so sweet. And Ethan was listening to it all, and Noah even came up and said, “She is saying all nice things to Anna, she’s saying all good things.” We don’t think anyone had actually told Anna what adoption was. I think she knew that “getting a family” was a good thing at the orphanage, but it was very vague. When I had to take her from her foster mom, it was scary, and suddenly she didn’t know if she was safe. She wasn’t sure if she’d been kidnapped or what. And so Molly, who has years of experience helping adoptive families, explained the whole thing. It was a turning point, and all night after that, I watched Anna turning that over in her mind. That night when I put her to bed, she had the most profound grief I’d seen. She was literally wailing and screaming that she wanted her foster mom, and it went on for so long that she eventually just wore herself out and fell asleep. I laid with her the whole time, and she didn’t acknowledge me, but she didn’t reject me either. The next morning was our consulate appointment, and things were just different. When I got her up in the morning, she smiled at me. It was just a little, but it was a start. She still preferred Nathan, but Ethan is absolutely attached to Nathan and asking him to piggyback him everywhere, so when I tried to carry her, she let me. 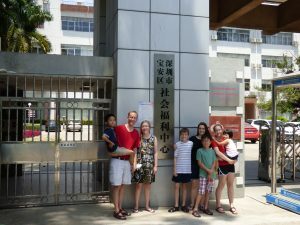 We went to the consulate in the scorching heat with one other family we have really enjoyed getting to know, and everything with our case went smoothly. 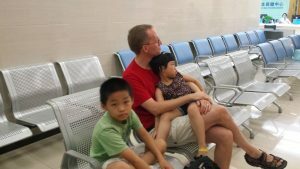 There was another family there who had been unable to get a passport for their child because the child’s provincial police computer system had crashed, and I felt so bad for them. They can’t leave without a passport, and it was really leaving them in a bind. Because of this, though, all of us there had to wait a long time. The kids were doing okay, but we got up very early, and they are showing it. 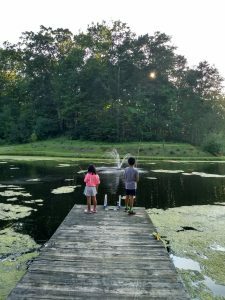 I am realizing again how many things can go wrong with this process, and we are so fortunate that even with adopting two, things have for the most part gone smoothly with the paperwork. 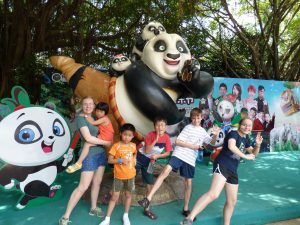 We headed straight home to pick up the other kids – we left them together at the hotel because there’s no reason for them to go to the consulate – and then we headed to Safari Park. I didn’t know if this was a good idea. I really can’t describe the heat. It’s intense, and it’s also incredibly humid, so it’s like walking around in a sauna. You’re instantly drenched. We don’t even care what we look like anymore, we’re just surviving. 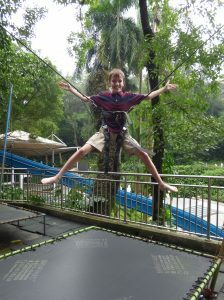 And given how tired the kids already were, we thought this might be a very stupid idea. But again, we’re hoping they have some good memories of the trip, and Ethan has never been to a zoo before. He kept asking us, “Tiger?” and we would tell him, yes, we will see a tiger. “Panda?” Yes, a panda too! “Elephant? !” Yes, an elephant! Any animal name he could think of from his English class, he was asking us! It really is an incredible zoo, and we only saw a bit of it, but it was so fun to watch them see it! At the beginning is a tram ride you can take through several exhibits, and Ethan’s face was absolutely priceless. He was over the moon! Every time we saw a new animal he would point it out and his eyes would get huge and if he knew it in English, he would yell it! He’s been trying really hard to use any English he knows. Reminds me very much of our trip with Noah. After we got off, we bought everyone some food. Noah really doesn’t do well in the heat with his heart, so we were trying everything we could to keep him in decent comfort. We had a cooling towel for him (and all of us, saved our lives that day!) and a little handheld fan, and were really pushing water. He needed calories, though, and wasn’t feeling great already, so we shared some chicken and then got everyone ice cream as a treat. 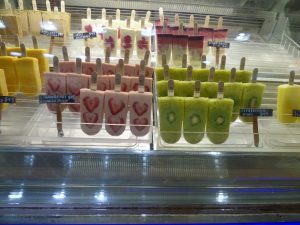 Have I mentioned that many Chinese people think cold foods are very unhealthy? With Noah’s heart, they kept telling me that if I fed him cold foods, it would kill him. Somehow, though, we forget this, and it wasn’t until I handed Anna an ice cream cone that I realized she had no idea what it was or what to do with it. She’d never had one before. I showed her how to eat it (I’m really selfless and giving and had to take several bites to show her adequately, of course) and she very tentatively took a bite. She was shocked at the temperature for about half a second and then she went to town. I have never seen so much ice cream on one person’s face. It was 100 degrees, so it was melting almost while we were watching and I went through a whole pack of Kleenex trying to save that girl’s shirt, but it was worth it. She thought it was the best thing ever! One very interesting and encouraging thing for me today was that we’d put Anna in a stroller, and she kept asking that I push it. She didn’t want anyone else. And I left her in the shade with Rinnah and ran over to help Nathan carry the ice cream cones, and Rinnah said she kept asking for me and was worried until she saw me. This is really good. She spent the day showing me things too, and asking to be with me – it’s a big change and very welcome. We got through maybe 20 percent of the park but it was absolutely teeming with people on summer break and so, so hot that I was feeling claustrophic. 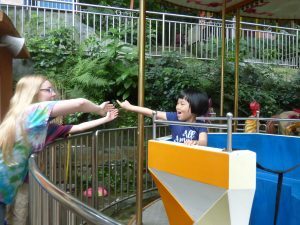 We went to see the pandas because that’s really something you come to China to see, and then we rode the new skyride. 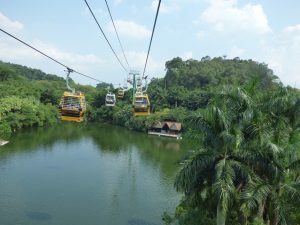 It was so neat, and took us over the whole park in a giant triangle – we saw so many animals, and the kids thought it was incredibly cool! They also weren’t scared at all which was interesting, because it’s pretty high up, but it was enclosed and we were all together in the car, so that seemed to make it fine. By this time we were all melting and it was time to meet our driver. I was getting a headache and Anna had not had nearly enough water – we kept offering it but couldn’t get her to drink. We were happy we were heading back. By the time we got home, I felt pretty awful and was getting a migraine. Nathan ran out for food (Noodles again! We are now regulars, but it’s close and so hard to walk farther when it’s this hot) and I had a little food and passed out. I woke up feeling worse than I ever have; I thought I was dying. I think I scared my daughter, Rachel, who was so sweet and kept trying to help me. I actually have no idea what happened the rest of that night – I was so incredibly sick. I even had the shakes like I got after I had my babies. I get migraines, but this was the worst one I’ve ever had. I wonder now, was it the dehydration? A reaction to MSG or something in the food? I have no idea, but it was brutal. I was able to get a migraine pill down finally and went to sleep, and slept for 12 hours until morning. Fortunately I have a rock star for a husband who just took over everything. I have no idea what I would have done if I was traveling alone. I woke up feeling so much better. I had a migraine “hangover” but I didn’t feel like I was going to die. This was very good because we were heading to Shenzhen to visit Ethan’s orphanage and I would have been so upset if we couldn’t go. These are never easy days, but they are so important. We want to know where our kids were, how they grew up, get them pictures and any information we can. We know they are going to want that someday. And this was our only chance this trip, so I was so grateful we could still go. Anna was not feeling well. I could tell right away, and I think she’s still dehydrated from yesterday and just out of whack. We were getting her to drink, but she wouldn’t eat breakfast which was a first for her – she’s been a very good eater. I packed extra clothes just in case, and we prayed she would make it through. 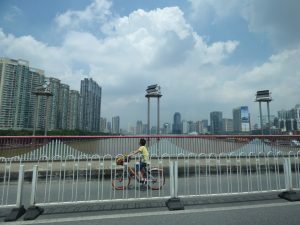 Shenzhen is two hours without traffic. We had a different guide today. Helen couldn’t make it because she had other families, so we went with Cordelia. She was wonderful. It turned out to be a good thing. Our driver was very nice, but seriously not smooth. Put that together with bad traffic and kids who have only rarely been in cars, and Anna was sick almost immediately. She threw up about 45 minutes into the trip, but somehow managed to miss most of her clothes and the people around her which was a miracle. I cleaned her all up, but it became pretty awful – we went through all the bags in the car and all the Kleenex and wipes we’d brought. I felt so bad for her and for everyone in the car! And of course, our guide told us this was because we’d given her cold ice cream the afternoon before. 🙂 But otherwise, she was unbelievably helpful. We finally (thankfully!) got to Shenzhen, and Anna felt better when we got out of the car. Compared to Anna’s orphanage, Ethan’s was pretty astonishing. It was like the Taj Mahal of orphanages. 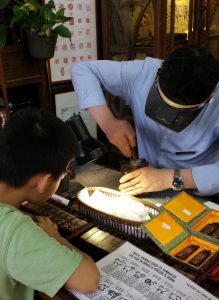 We’d been told that Shenzhen is one of the richest cities in China because of it’s proximity to Hong Kong and clearly they have a lot more resources here. 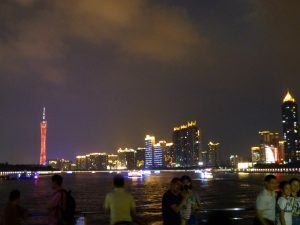 Also, Shenzhen is one of the youngest and fastest growing cities in China, going from a small village in the 1980’s to a city of over 20 million less than 40 years later. 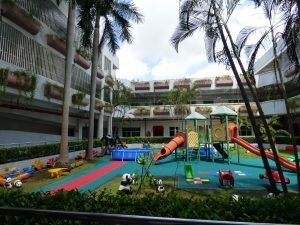 Ethan’s orphanage is called a “Social Welfare Institute” and actually has one side for children, and another side for the elderly. 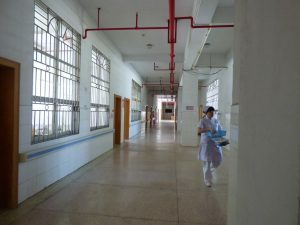 It also has an entire medical clinic complete with housing for the doctors and nurses, and schooling for the children up through kindergarten. It was immaculate. We got to meet Ethan’s kindergarten teacher and see his preschool and kindergarten classrooms as well as the playground and “baby room.” We couldn’t take pictures in the baby room here either as we were told they were all napping. But when we peeked in, they were children between 3-7 or even older having more of a quiet time than naps. There was a lot of rustling and whispering and when we looked in, many curious faces. 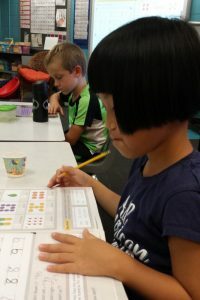 Even though there were 30 kids in the room, it felt more like an imposed break time from summer camp (they kept telling us it was summer camp when school was out). It was still an orphanage, but it was a lot less sad. I don’t know. I am happy that this was his experience, maybe more like a somewhat impersonal but not bad boarding school than an institution. His teachers were very happy for him to be adopted. We were told one of his best friends was in the room, but we weren’t allowed pictures with him or to meet him. He cannot be adopted because he is not legally free, so they have to protect his privacy. 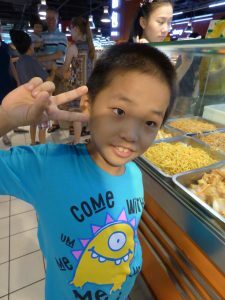 We were able to ask Ethan for his name, and they said he could send an email to him through the orphanage if we wanted to. We also found out the answers to several of our questions. 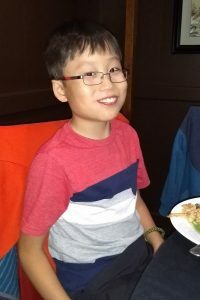 The most important to us was where Ethan had been for several years – he had only been with his foster family for a year and a half, and we didn’t know what had happened to him in the time before that. We got our answers, and they were pretty positive, so that is good. We still haven’t been able to get many pictures of him during his life, and that makes me sad, but we’ve managed to track down a few, so that is something. They asked if he wanted to see his foster mom to say goodbye. After what happened with Anna, we had no idea what the wise thing to do would be. We didn’t want him to feel like we denied him the opportunity, but we also didn’t want unnecessary trauma. In the end, we asked him if he wanted the opportunity to say goodbye to her. He said he did not want to see her. He was asked several times, but he refused. I think he saw what happened with Anna and he was afraid of feeling that sad. 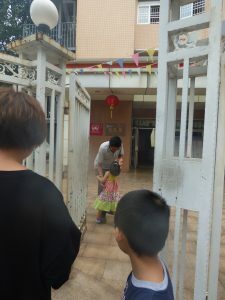 We did reassure him that we have his foster mom’s WeChat and we can stay in touch with her, and that seemed to be all he needed. We hope we didn’t hurt her feelings, but we explained what had happened with Anna and just said we thought he didn’t want to be that sad, and they said they would tell her. After our tour, this orphanage had made us a beautiful lunch that we had with the director and a few of the staff. It really was a feast – they clearly went way out of their way for us. 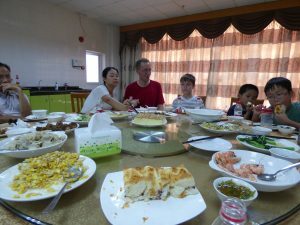 The director told me that “it’s not every day we have the United States family of one of our children visit, and we want to make you welcome because it is a long way.” Our guide confirmed that this was a very unusual and special lunch. We had a whole fish, shrimp (with heads on and everything, a funny thing to watch the kids figure out! ), duck, choy sum, corn and pine nuts, stir fried cucumber, dumplings, shredded potato, sweet pea soup, scrambled eggs with onions, rice, cake, and a bread that I totally thought was cinnamon rolls and didn’t try but Rachel told me later was red bean bread with dried, shredded pork floss on top (she said I was glad I didn’t get that one and here I thought I was just being good not taking the cinnamon roll, lol!). It was very generous and kind of them! And I’m always happy to get food like this, because it’s a lot more like what our kids ate day to day, and that helps me to know what they are used to rather than what we get in restaurants which is more “special” and not family style food. After that, we left and went to look for Ethan’s finding spot. This is an important piece of history for our kids, but it is also very hard. In Ethan’s case, it was even harder. 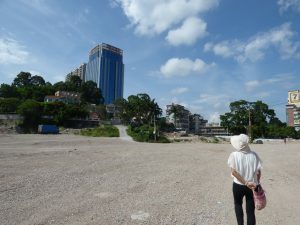 It turns out that because Shenzhen is growing so fast, it’s pretty constantly being torn down and put up again even higher. 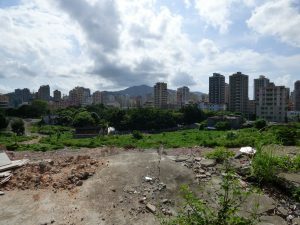 The address we were given was not terribly specific, and was in the second district of a certain area, and it turns out that nearly that entire district had been razed two years prior. We wandered around a bit, and Cordelia was walking around and asking some local people if they knew where the second district was. We ran into an extremely kind policeman who called in and asked others older than him (he was very young!) if anyone remembered the second district or had information about this address, and he ended up leading us through all these alleyways, etc, into the old second district. It was not at all what I had imagined. And we had to talk to several people looking for information and move several times before we finally ran into one older local person who remembered exactly where it had been. It was just a flat, razed expanse covered in gravel. They said everyone had been relocated and all the buildings were gone. The government was building a new area soon. This was very sad and hard. There is not much hope that our kids will find clues about their past if they want them someday no matter what we do, but this situation makes it pretty much an impossibility. I am sad for Ethan. We took the pictures we could and got the only clues there were, and headed back. Traffic was so much worse on the way home, and so was Anna. It took nearly 4 hours to get back, and she was miserable and sick the whole time. We all felt so bad for her, and so drained from all we’d seen. I’ve never been so happy to see a hotel in my life! Even though it was such a hard day, I think it’s so important that we did it and I am grateful we were able to go. 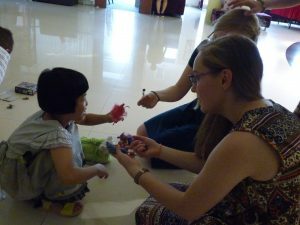 We’ve talked to many families who were not allowed to visit their child’s orphanage, and we feel blessed to have that insight into their early lives. We are a little worried about Anna and traveling to Hong Kong tomorrow. She doesn’t have any fever, fortunately, and we are getting a little fluid into her, but she’s not eating. We’re really praying she feels better in the morning and that this is nothing serious. We picked up the Chinese equivalent of Gatorade (labeled Pocari Sweat which is gross and funny at the same time) to try to tempt her and get something into her, but she wasn’t very interested. Tonight, Noah got a little teary and told me he really misses our dog Pepper, and he “just wants to go home now.” It has been interesting to watch Noah back in China. Nathan and I fully expected this trip to be hard on him, and thought we might see a good bit of regression or him feeling displaced by his new siblings or missing his foster family or any number of things. Almost none of that happened. He did have the one very hard night thinking about his foster parents after our experience with Anna’s foster mom, but otherwise he’s been amazing. 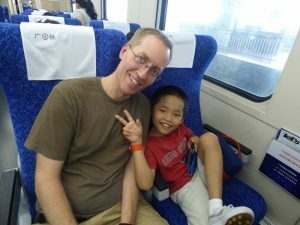 He’s taken being back in China totally in stride, has been helpful and mature, has been helping to translate for the new kids, has been fine with not seeing his home city (which we did ask him about, but he understands it’s about 1200 miles away and just not feasible), and has generally just been great. 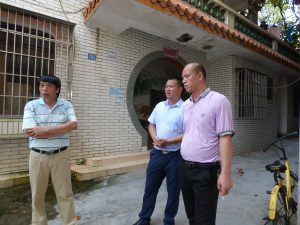 We talked about how we’d like to bring the three Chinese kids back in several years to visit all their former homes, etc, and that seems to be enough for him. To see him actually teary while in China because he misses our home and knows it’s his is pretty awesome, actually. I am so grateful that he knows this. He was happy to come with us to China, but our home is where he belongs now and he was ready to go back. 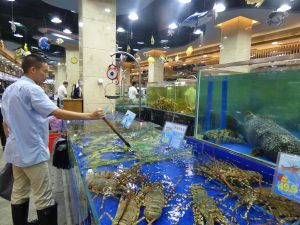 Although I know he will still miss the food in China! I did run out later that night for just a few minutes to meet up with one other mom I’d been talking to online for months who was also staying in our hotel. It was so fun to meet face to face! I wish I’d had more time, but I couldn’t leave Anna any longer and she was busy with her new son too. You share all these experiences in the months leading up to the adoptions, and I know I will love seeing her new kiddo growing up home safe with his new family. Tomorrow morning we leave for Hong Kong by train, and then home shortly thereafter. We are all ready. We even have our own little section at the clinic to wait in. Ethan was mesmerized by the artist carving our name chops. Nathan keeping Ethan from a collision! Anna and her jie jie have got this! Toby rocking the trampoline park – my favorite activity when it’s 100 degrees! The most amazing menu translations ever. First time at the pool for Ethan and Anna! The dim sum place we actually liked even though the entire restaurant stared at our family the ENTIRE time. The fish market just outside the entrance to our cruise – who needs an aquarium?! Since we’re in a fast province as far as the adoption goes, we have to keep moving. The next morning, we had the kids’ medicals. Each child has to pass a medical clearance in order to enter the United States. They do a very perfunctory ear, nose, and throat exam, a very quick eye exam, a height and weight, and 2 minute physical with a pediatrician, and then they take a blood sample for a TB test. We have to wait 48 hours for the results of the TB and if they are positive, we have to go back for a chest x-ray. I was dreading the medical. After the day we had with Anna’s foster mom, Anna was completely rejecting me, and I didn’t want to be the one who took her for a blood draw. We sent an emergency prayer request to the family about this Wednesday night, and I was sick to my stomach thinking about it. But medicals went surprisingly well. The kids both did fine, and neither of them even blinked at the blood draw. They just put their little arms on the table and watched them do it. It was a little uncanny, actually, and not really good. Noah did the same thing, and it wasn’t until he started trusting me that he told me anything hurt. But at least it wasn’t more trauma for our relationship at that moment, so I will take it. We stopped quickly and in the pouring rain after the medicals at the Clan Chen Academy to order chops for our Chinese kids. This is a traditional stamp with your name carved in it that serves as your signature. We got one for each Chinese child with their American and Chinese character names, and also ordered one for our family name, Shaw, for the rest of us who aren’t so lucky to have Chinese character names to use. It was amazing to watch the artist carving them – Ethan was enthralled. We had the rest of the afternoon off, so we decided to keep it really low key. We got food in the room for lunch, and then we read books and played games in the room. We went downstairs after a while to the playground and met up with a mom, Ashley, who I’d been talking to online for months. She and I were on the same timetable, and had been helping each other with each of the adoption steps. 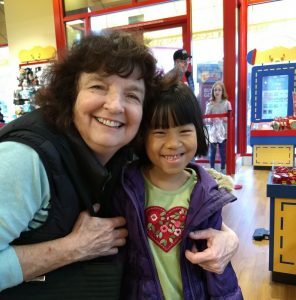 She adopted a little 3 year old girl who is the size of a 9 month old and has many medical issues. Ashley’s husband came for the first week and then went home to be with their other kids. They’ve had a really hard time, and this little girl has a tough road ahead of her, but it was wonderful to see how much she was already loved and how much she has already learned to count on her new mom! She has a chance at a completely different future, and when I looked at her, I knew she was in there! We had one tough moment in the playroom while we were hanging out where a boy came and took something Ethan was playing with, and he crawled under the play space and just stayed there angry and sad for a while. We got as close to him as we could and let him know we were there, but we couldn’t get him out for a bit. This boy definitely likes to hold his cards close to his chest and take care of himself. Eventually he recovered and came out on his own. It’s not about the toy at this point, which we know, but sometimes the kids just need an excuse to feel what they are feeling. We went back to the room and Anna took a nap. When she woke up, she just laid there for a long time. I finally went over and rubbed her back and asked if she was okay and just a single tear rolled down her cheek. I realized, “Oh, okay, we’re not okay” and laid down with her. Almost as soon as I did, she started crying hard, and then she was sobbing and yelling for her mama. Noah came over and said she was saying, “I want to go to my mama’s house!” over and over. It went on for at least 20 minutes. There’s not much you can do except to let them know they aren’t alone, so I just stayed with her and rubbed her back and told her it would be okay. Ethan and Noah were both in the room (Nathan and the other kids were napping in our other room) and were worried about her. Ethan talked to her every once in awhile, and I don’t know what he said, but the third time he did, she just stopped crying and got up to play with him. He’s been really sweet to her in general, helping her with many things – this is a wonderful glimpse into his personality. Anna’s grief is hard, but it’s also what we were expecting. It’s totally normal, and actually a good indicator of emotional health even though it’s absolutely excruciating to witness. 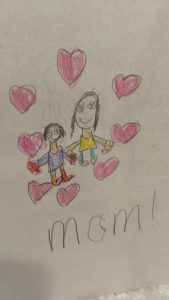 And now, of course, I’m wondering if I’m helpful when I’m there, or if I’m just the wrong mom that she still doesn’t want and it’s making our relationship even harder to begin. Later that evening, Ashley brought her baby back over to our room and we had dinner together. They are heading home tomorrow, and I will be praying for her flight! 16 hours is a long time by yourself with a new and high-needs baby. Friday was a free day. We took it easy in the morning, and then decided to head to the museum next door. When we got outside, though, and realized the weather was really good (it was supposed to rain the whole time we’re here, but we’ve been pretty lucky with the weather as far as rain goes – still, we try to take advantage of the sun when we see it!) we decided instead to go back to the park we took Noah to last year that’s across the street. We rented some boats. Last time we did paddle boats, but it was already 100 degrees, so we went for the electric ones – no one needs to do any more exercise than necessary! 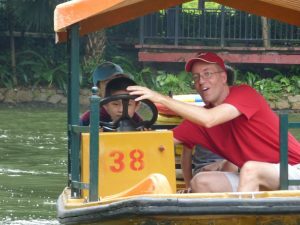 That was really fun – we all took turns driving, even the little ones, and we tooled all over the lake. 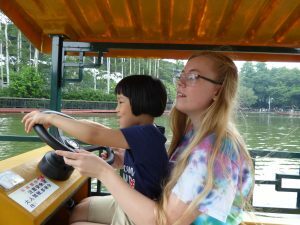 We had a boys’ boat and a girls’ boat, and even though Anna wasn’t thrilled about going with me, her beloved jie jie’s (older sisters) were with her, so she went with it. Then we brought them back (girls’ boat won! Anna was so proud) and there were a few little rides nearby that we let them do. By that point, we were all really hot and it was lunchtime, so we tried to find a dim sum restaurant our guide had told us about. We got very confused by the directions and learned a lot more of our neighborhood! But eventually we found it. They put us in our own room because we are a huge party. None of us loved this place – we won’t be back. But, it did give me maybe my favorite picture of bad food translations of all time, so there’s that! 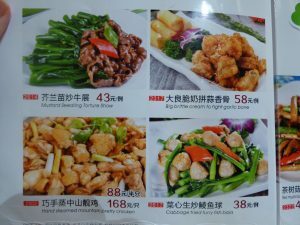 In case you can’t read them in the picture, the four foods listed are “Mustard Seedling Torture Show,” “Big Brittle Cream to Fight Garlic Bone,” “Hand Steamed Mountain Pretty Chicken,” and my favorite for a light luncheon, “Cabbage Fried Furry Fish Balls.” It was pretty hard to choose. We ate dinner in again and finished watching the Lego Movie. We also met up with another family I’d been talking to online and their new little guy. They dropped by our room and played with our kids. They were just arriving in Guangzhou from their child’s province. So fun to get to know them – they are both from Michigan and work for the same company Nathan’s brother works for. Their little guy was so cute! He has the same heart issue Noah has too, so we had that in common. Then they headed out and we headed to bed. The new kids are doing really well with sleeping, but not so well with going to bed. We have to tackle them a bit! But if we can get them to lay still for a few minutes, they pass out. Saturday we got the all clear for their TB tests, so no x-rays and we were free until that evening. That morning we decided to try the museum again. We had no idea what it was, but we had heard it was good and cheap (yup, family of 8 for a total of $4.50US admission). It turned out to be the tomb of a Nanyue king. It was pretty fascinating and a little creepy (he was buried with quite a few human sacrifices to make his post-earthly life easier – note to self, never become valuable to an ancient king) and much bigger than we realized – you could go into the actual tomb, and then there was a huge museum of everything that had been found in it. We didn’t see a lot of it – Ethan was not interested in the museum at all, just the tomb part, so we tried not to push it too much. That afternoon everyone went swimming again while I stayed back and tried to catch up on my writing! It’s been hard to find a moment for it, but I hate to miss it because I’ve loved the record I had of our time with Noah. And let’s be real, it’s also been hard to be constantly rejected by Anna, and I was sad and needed some time. Then we all got cleaned up and went on the Pearl River Cruise. 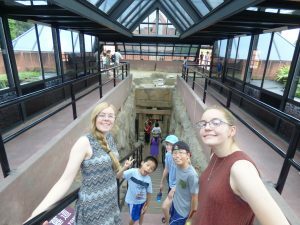 We didn’t do this last time, and weren’t sure we wanted to bother, but we haven’t had time to do much with the speed of this process, and thought the new kids might want a few fun memories of the trip rather than all government offices. We had the choice of getting the Chinese buffet on the cruise or having our guide bring us pizza. We would normally never dream of getting pizza – for one thing, we’re in China so we enjoy the food, and for another, China is NOT known for their excellent pizza. 🙂 But we had heard a number of people say they’d gotten sick from the buffet and we thought that sounded much more terrible than Chinese pizza, so pizza it was. The pizza was… interesting. The first offered topping was durian. The other types were equally as “foreign” to us. Both Chinese kids opted for something that ended up being very like Korean bulgogi on pizza, actually the best kind we tried. Nathan got “luxurious” pizza which looked like supreme and it was, but the addition of sliced hot dogs and squid was a bit off-putting. We also got a couple “classic Americans” listed all the way at the bottom of the page. This was pepperoni, but unlike any pepperoni we’d ever seen before. We all ate something, and we all had a ton of pizza left, which is a statement perhaps about the pizza. But the pizza is not why you take the cruise! After we ate the little we were going to, we headed to the top deck. This was really beautiful. We were cruising down the Pearl River as the sun set and all the lights came on in the buildings on either side. All the other boats were also lit up, and every single time one went by, Anna yelled, “Mama, mama!” and mimed taking a picture – she knew I had the camera and wanted a picture of every single boat. This was great and hopeful because she was actually interacting with me. She also discovered a speaker on the deck that was playing music, and this was profoundly surprising and puzzling to her. We think she’d never seen one. She kept gesturing to it and then gesturing, “What? Where?” to ask where the musicians were. It was really cute. Ethan was having a harder time. We can tell he’s really homesick now and grieving, but he wants to “be a man” and not show any emotions. He was acting up a lot and really having a rough patch. Nathan ended up taking him below and just letting him play fruit ninja on his phone for the rest of the trip. 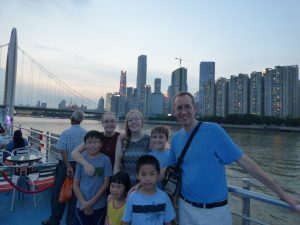 A lot of our time in China is just surviving, and Ethan had just had enough and needed to unplug for a bit. We had been told there was a show on the second deck halfway through the cruise, so we checked it out and it was the angriest looking juggler I’d ever seen. Frankly, her facial expressions were the most amusing part for the adults in our party. We were still hanging out with the other family, and every time the juggler finished a trick and people would clap, she would glare around like, “I can’t believe this is what my life has come to and I’m doing this stupid routine AGAIN!” It was so over the top that we were all giggling. Then this terrifying woman was spinning a basketball on her finger (she was really pretty impressive, both in skill and in facial expression!) and all of the sudden she came over to Anna and reached out her hand. Anna looked at me like, “What do I do! ?” and I held her other hand and told her to give her hand to the woman. She looked very nervous, but the juggler just spun a ball on her finger. Then she took turns doing that with all my other kids except Ethan who was downstairs with Nathan. I don’t think Anna knew what to think! But since the other kids did it, she decided it hadn’t been bad and the woman was not trying to steal her. We headed back up for the end of it. It was about 1.5 hours, and Anna loved every minute but she was getting tired. Ethan and Nathan survived, and we headed home. I feel like Anna and I have made at little a tiny bit of progress, so that’s good. But I’m still hoping we can figure this out sooner than later, and we’re worried about Ethan now too. We’re praying and we’ll get there. Sometimes it’s hard to remember that we’ve only known these kids a few days! We couldn’t take pictures that would show any of the other children’s faces, but they let us take this one of Anna next to the crib she was in when she lived here. 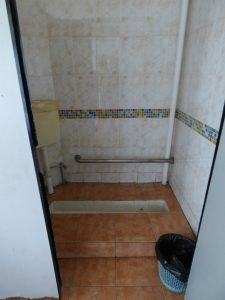 Their bathroom. The kids were bathed in the sinks, and this explains why she thinks the shower at the hotel is the most fun thing she’s ever seen in her life – she’s never seen anything like it! Coloring while waiting for her foster mom. Our family with Anna’s foster mom. Wednesday morning we got up early and met our guide, Helen, to go to Anna’s orphanage. Anna is from Guangzhou in a newer district just south of where we were staying. The plan was to tour the orphanage and then go to her finding spot. Then this afternoon we need to apply for the kids’ passports and then we’re going to the bookstore to try to get more books in Chinese for Noah and the new kiddos. Frankly, this day was very traumatic for all of us. 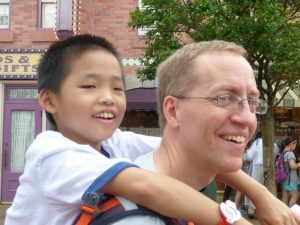 We have enough experience and knowledge from the training we’ve done and our adoption of Noah to know that all kids who are being adopted are going to have some serious grief and tough feelings to work through. You just don’t really know when it’s going to happen or what form it will take. 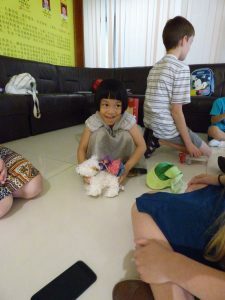 Going to the orphanage, Anna was very happy. She wanted to show it to us. We weren’t sure if she was happy to be going back and thinking she was staying or happy to show it to her new family and then leave. When we arrived, there was a man out front that she clearly recognized and ran to. He looked absolutely delighted to see her and picked her up and hugged her. 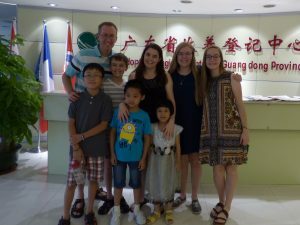 Our translator told us that he was a relative of her foster family. 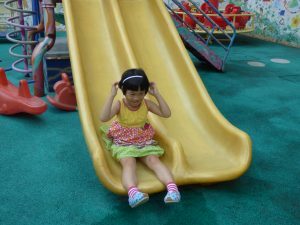 She happily turned back to us and gestured for all of us to play on the playground outside the building. We’d seen many pictures of her in this space, but it was so much smaller than I thought it would be from the pictures. She ran around and showed it to us, chattering the whole time, and then they asked us to come inside. We walked through a small lobby and could see the kitchen and the laundry room off two of the sides along with a staircase. 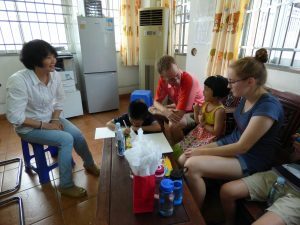 We went around a corner to the meeting room, and with the eight of us, two orphanage staff, and our translator, it was full. 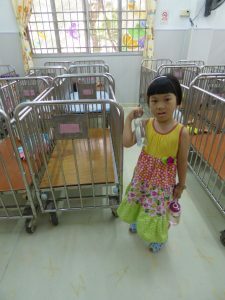 They told us a little about the orphanage and asked if we had questions for them about Anna. We asked our questions about her background, medical care, etc, and then they took us to see some of the orphanage. Much of it was off limits to us, but we went upstairs and saw the baby room where Anna lived. 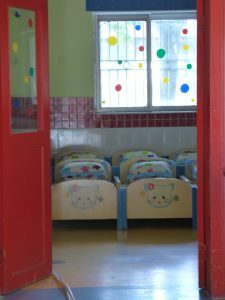 I had been taking pictures, and they told me no pictures in the baby room because there were children in there who might be adopted and they needed to protect their privacy. The baby room was kind of a punch in the gut. We saw Noah’s baby room, and it was emotional, but the babies were not there – they were in the playroom at the time. And I’ve been in a lot of orphanages, actually, so it’s not new to me, but still, I think I was just not expecting what I saw. 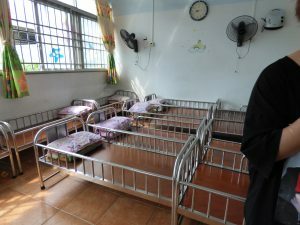 There were 25 or 30 cribs in the room, and probably 20 children in them. Some were asleep or lying down staring at us, but most were standing in their cribs and all eyes were trained on us. They were not making any sound, just staring at us. And these were not really babies – they looked to be anywhere from 1-4 years old. The room was clean and had two staff in it. But what really hit me for some reason was that there were no mattresses. The children were sleeping and standing in all these metal cribs on plywood. They looked like boxes or crates. I don’t know why, but the fact that they didn’t have mattresses in their cribs really bothered me. It bothered me a lot. And the staff were all looking at me and obviously did care and were doing the best they could with what they had, but I was looking at 20 silent, staring children in plywood and metal boxes. And this is where Anna lived for the first few years of her life. The translator was telling me that 150 children live in this building, and about 25 of them get placed “outside” in foster care, because it’s “better for the children to have more attention if they can.” And she’s telling me that most of these children will never have paperwork done to even give them a chance at adoption because they have “very big problems” and no one would take them. And that the older children live on the upper floors, but we aren’t going up there today. And basically she’s saying that the majority of these 20 silent, staring children who are looking right at me in this moment will never leave here. They won’t even have a chance. And I’m looking at Anna who doesn’t see anything weird here at all because this is what she knows, and she’s smiling and bouncing and wants to show us where she slept in the bigger kids room when they took her from foster care while she was waiting for us. “Do they get out of the cribs?” I couldn’t help it – the question was out before I realized I’d said it. “Oh, of course, every day they go to the playroom. But today it looked like it would rain.” Oh, okay. It’s going to rain today, so they will all stay in their own little boxes. My eyes were filling with tears, I couldn’t help it, even though the workers were all looking at me, and I didn’t want to hurt them when they were so obviously trying to do the best they could. And we turned and left those children there, and in that moment I thought, “O, God! If your people could see this, really SEE it, it wouldn’t have to be this way! The world is so broken, and I am trying, trying to fix just the tiniest corner, but Lord have mercy, it’s too much!” Those children will haunt me. We went downstairs and were told that Anna’s foster mother was coming to meet us. We had asked about this. I wasn’t sure if I wanted it to happen or not, frankly. I really wanted to meet the woman who had been raising her for the last four years, and we’d been messaging since our WeChat call, and it’s clear that she truly loves Anna. I wanted to meet her and thank her. But I also had no idea how Anna would take it. One note about foster care here. So many people have asked me, “Well, why don’t their foster parents just adopt them? 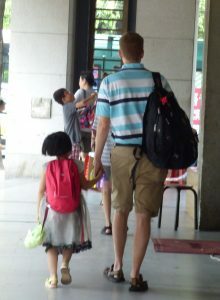 !” Foster care in China is not like it is here. You aren’t allowed to adopt if you have biological children (all of our kids’ foster parents have their own children) and it’s more of a job where they are paid to care for the kids until they are placed for adoption. 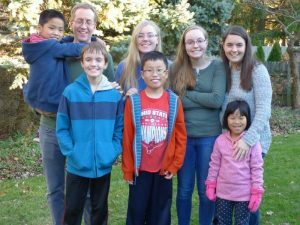 That doesn’t mean they don’t love the kids – we don’t know much about Ethan’s foster family yet, but clearly both Anna and Noah’s foster parents loved them dearly. But adoption was never a possibility. This is a temporary situation that can never be permanent by law here. So while the parents miss them terribly, they are usually very happy for them to get a permanent family. So, Anna’s foster mom came and it was pretty awful, actually. She walked in and we hugged, and that was wonderful, and she was so pleased and happy for Anna and to meet us, but Anna wouldn’t even look at her for a minute. And then when she did, it was like a dam broke. She cried out, “Mama!” and jumped on her and started sobbing. Her foster mom also started crying but just kept telling her it was okay and pointing at us and saying what a wonderful family she had and look at her big brothers! And look at her big sisters! And look at her mom and dad! And how happy she would be in the United States with her new family! Eventually Anna calmed down enough that we were able to go outside, and she even got down and ran to the playground again with the kids. But when she realized we were getting ready to leave, she ran back to her foster mom and she picked her up and Anna wouldn’t let go. We were all crying, and they were telling me we had to leave, and Anna started screaming “Mama, mama!” and sobbing, and her foster mom looked at me and gestured for me to take her and she turned away crying into the orphanage and I had to carry Anna away. It was one of the most gut-wrenching scenes of my life. I held Anna in the van and she sobbed and sobbed and then finally went limp. I asked my girls who were sitting behind us if she had fallen asleep but they said no, she was just staring. She sat like that for a while, and then all at once she gathered herself up and slid off my lap into the seat next to me and turned her face to the window. I tried to hold her hand and she slid hers out of mine and folded her hands together and took a deep breath and looked out the window, just utterly dismissing me. I gave her space, but also wanted her to know I was there. The guide was saying that they didn’t usually let families meet the foster parents, but we had asked, etc, etc. Really, we had just asked if we were going to meet them because we had heard others had, but perhaps it was misunderstood, I don’t know. And I know sometimes it can be very helpful in the long run for the children to know that they’ve gone with their new family with their foster family’s blessing, but seeing what we’d just put our new daughter through for no reason, I was just devastated. We stopped again at Anna’s finding spot. That is a terribly painful thing to do without the scene before it. We took pictures for her and video taped the area, but there really wasn’t much else to do. We were only there a few minutes, and there wasn’t any way to ask questions of anyone there or get more information so we just left. They took us back to the hotel for a bit and we had lunch and rested and then we had to leave again for the passport office. Anna very clearly wanted nothing to do with me. This is the same little girl who told everyone I was her new mama two days ago. She was happy to be with Nathan, but she was not going with me again. She will know that I love her at some point, and frankly, Noah didn’t like me either at first and loves me now, but this is tough. I do not want to be associated with that terrible moment in her memory forever. And I’m wondering why, when there were 3 other orphanage workers, a driver, and a translator, why was I the one who had to carry her away? I regret this deeply. You can only move forward from where you are, but I would do it over in an instant if I could. I would tell the foster mom not to come. I would ask someone else to carry her to the car. We are going to Ethan’s orphanage later in the trip, and I have no idea what we’ll do if they say we can meet the foster family. Will he be upset that she got to see her family and he didn’t get to see his? So many unknowns. After the passport office, she seemed to be rallying a bit. We had brought Noah with us too so we could stop at the bookstore and try to get all our Chinese kiddos books in Mandarin. They are so inexpensive here and so much harder to find in the US! We have scrimped in every way to bring our other kids with us on this trip, and we are spending nothing on food or souvenirs, but one expense we had planned on was books! This bookstore was 6 floors! The entire fourth floor was children’s. It was chaos – kids everywhere throwing books around (this would not fly in any US store!) and general mayhem. Anna and Ethan were both overwhelmed at all the sensory stimulation, and we were having a hard time just keeping track of them. Anna handed us pretty much every Barbie book in the store. And Ethan apparently loves Thomas the Train books. We finally got out of that section and found the older youth books for Noah – he’s been counting the days for this trip for months! We found several things he was dying to have, and in the end, we probably have 30 or more pounds of books. But at $2 each, we cannot pass up the opportunity. Our issue is going to be getting them all home! We headed back and took the family out for dim sum. We’ve been eating in the room a lot, but with a mini-fridge, we just can’t keep enough for 8 on hand with no transportation. Fortunately, food is really inexpensive here. We got into our booth in this new, huge dim sum place, and Noah was acting really weird. He’d been grouchy and touchy all day, and Nathan told him not to run in the street while we were walking to the restaurant and he was just livid. I almost brought him back to the room and let everyone else go, but in the end he came with us. Well, as soon as we sat down, he put his head on the table and started to cry. Then he started hitting his head on the table – I have never in the 16 months we’ve had him seen his act like that. And I couldn’t get him to talk to us or tell us what was up, he was just sobbing with his head on the table. And I was already emotionally just exhausted from the morning we’d had with the baby room and with Anna. So first he told me it was because Dad said he could have his ramen noodles in the room but he’d had to wait 2 days because we kept taking him out to dinner. Okaaay. I asked if that was really why he was so sad he was sobbing in a restaurant? And he said that Dad had also told him he couldn’t run in the street. And I told him Dad didn’t want him to get hit by a car. And then he said, “And Anna’s mom came to see her when we went to her orphanage and my foster parents didn’t even bother to show up! !” Ahh. Okay. So I immediately told him that his parents weren’t allowed to come – his orphanage did not allow parents to meet foster parents. And that they loved him and would have come if they could. And that they cried when they heard his heart surgery was successful because they love him. And that it was just the rules of his orphanage, but they love him. They love him. He calmed down after that. And then got a little bitter about his orphanage. He’s also mad that Anna and Ethan’s orphanages got them a cake when they were told they had a family and let us WeChat with them when his didn’t do those things. And I just said, “hey bud, but your baby room had mattresses, and the people there loved you. There are good and bad things everywhere.” And he seemed to hear that and he caught up to me and held my hand on the way home even though he’s 10 years old and that’s usually just too embarrassing. Wow, what a day. I’m just exhausted. The world is a hard, hard place for our little people. I’m praying that we can help, but more than that, I’m praying that we can point them to the only One who can truly heal all these hurts. And I’m praying that He will comfort my heart tonight too, just like He always has and always will. Heading out! Hong Kong, here we come! Our wonderful friends, the Loks! Some of the many apartment buildings in their neighborhood – the population density is incredible. Just about a year ago, I saw a picture of Ethan for the first time, and that started this journey. It’s been a long, long year of paperwork and frustration. 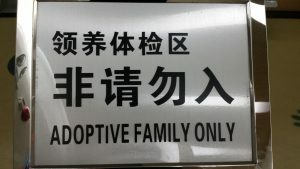 For some reason, these adoptions have been much more problematic. 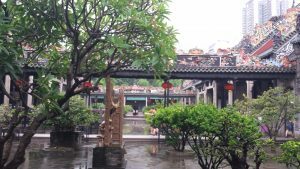 We had what felt like constant obstacles and delays, and it feels like a miracle that we are actually in China. I’m sitting on a train leaving Hong Kong, and headed to Guangzhou in mainland China. We will meet Ethan Long Ning and Anna Ru Xuan tomorrow. To be precise, in 27 hours. Not that anyone is counting of course! But it feels surreal. We’ve gotten very little information about our new children over the past year, but we have already fallen in love. 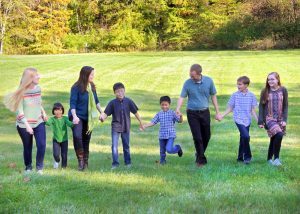 We are anxious to get to know them, and learn how to be the particular parents they need. With all the delays, you would think that we would have been completely ready to go, but in true Shaw fashion, we underestimated our time. So what felt molasses-slow ended up being a race to the finish to get out the door on time. 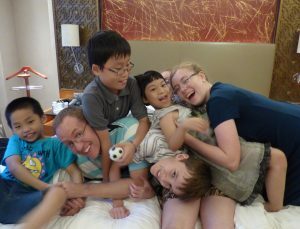 The kids got a decent night’s sleep before we left, but Nathan and I were up until 2 am checking and re-checking all our adoption paperwork and visas and checklists. Not that it mattered too much anyway – I knew I wasn’t going to sleep and I didn’t! It’s too hard to shut off your brain. My brother came at 8am and we loaded up our car. We try very hard to pack light, but since the forecast is 95 with 100% humidity and thunderstorms every day, and we have no access to laundry, we know we’re going to be yucky and want extra t-shirts. Add to that the fact that I’m having to guess at Ethan and Anna’s sizes so I’m having to bring extra things for them (and a sewing kit and safety pins in case their shorts don’t stay up!) and a group of 8 (!!) and we have more than we’d like. We catch our flight to Chicago with no problem. Somehow I feel like I’m home free after all the trouble of getting here! But then halfway to Chicago, a woman a couple rows behind us had a medical emergency. We weren’t sure if we were turning around, but praise God, she was actually seated next to a doctor and he monitored her and she looked much better after a bit. The pilot flew like lightening and we were in Chicago early. 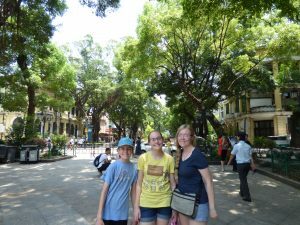 We all had to wait for paramedics to take her off the plane, and thankfully she was only a little woozy by that point, but we are just feeling relieved to be here – if we’d turned around we would have missed our China flight. In O’Hare we hoofed it all the way around to the new terminal and got some Chicago deep dish for lunch – airport style. 🙂 Not too bad. We’ve asked every airline person we’ve seen so far if they can move our seats on the long flight, but everyone just keeps telling us to ask the next person. Even here, we were told to ask someone who was coming an hour before the flight. We had to book so last minute that we had all center seats scattered throughout coach which sounded horrible for a 16 hour flight. I had snagged two seats together when they opened up at one point, but they were on the opposite side of the plane. Finally the magical person showed up. She wasn’t able to get us together, but she did somehow get us one group of three. So we had the girls together but all the way on the other side of the plane, and then me and the boys in the group of three, and then poor Nathan by himself in the middle seat behind us. It wasn’t too bad though – God is so funny. Both the people he was sitting by had connections to ministry, and he enjoyed hearing about that and sharing about our adoption. 16 hours is really long. Like, really long. Eiyiyi. And everyone was excited to pass the time by watching the movies and stuff they offer in the back of the seat on long flights. Except that the TVs worked everywhere in the plane but our section. Yup. And that meant I was with a 10 and 12 year old boy who couldn’t do anything but watch all the other people watching movies and playing games! And even the light controls were tied to the screens, so if the TV wasn’t working, you were sitting in the dark. So no reading or anything either! Fortunately we had our charging bank, so they got out their tablet and played together. Screen time rules do not exist on 16 hours flights! Finally, about 4 hours in they rebooted again and we got our screens working and we were all thankful. No one slept much. Noah did the best and slept about 4 hours. I got about an hour. I just can’t do it – too much noise and your legs start to hurt so much, etc. I know I’m whining, but about 12 hours in you just want it over! But we all made it, and that was a relief. When we got off the plane, we had about 30 minutes of immigration, baggage claim, customs, and then we walked out and saw our friends the Loks waving and smiling at us! So good to see them! 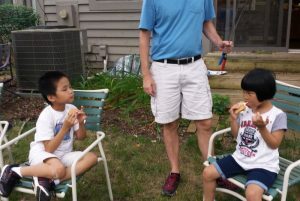 Their daughter, Chung Yan was one of our son’s best friends for years at school, and they were neighbors of ours. 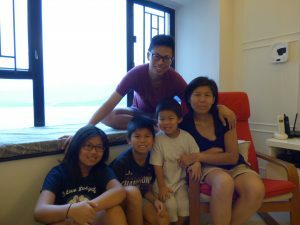 They moved back to Hong Kong about a year ago, and so graciously offered to host us while we were in Hong Kong. 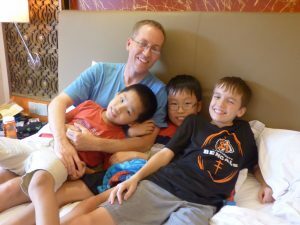 We added these few days at the beginning of the trip to let our body clocks adjust a bit to the 12 hour time difference before we were meeting brand-new-to-us children – it seemed a wise thing to do, and also let us have a little cushion in case flights were delayed or cancelled. The Loks got us to the bus with all our stuff and we rode about 45 minutes out to their apartment. 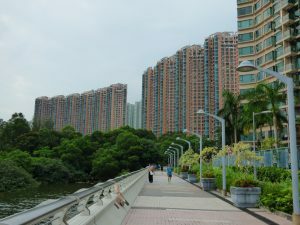 They live on the 26th floor of a 29 floor building and told us their building was “pretty short.” It is something that always strikes me – the population density is amazing here, and there’s no such thing as a single family home. Just high-rise after high-rise. 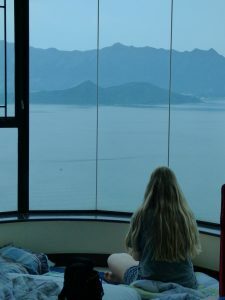 Their apartment is beautiful and looks out at the mountains and water. 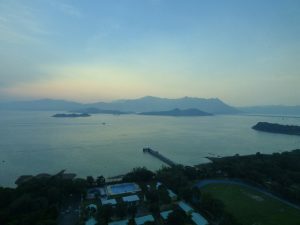 Hong Kong looks like a fairy tale, really – the extreme green of the mountains plunging into the blue of the water all around, it looks like the mermaid lagoon from Peter Pan. It’s a beautiful city. We got to their apartment at around 8pm Hong Kong time, 12 hours ahead of home, and had been traveling for 24 hours straight. They ordered food, and we had a great meal of Hong Kong style fried rice, pork, lemon chicken, and a delicious soup with greens. After the incredibly awful (incredibly awful!!!) food on the plane, it was heaven. 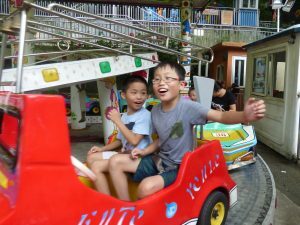 Toby and Chung Yan were having so much fun catching up, and her little brother is exactly the same age as Noah, so they were having fun too. We just chatted and got everyone a shower (which is no mean feat with one shower and so many people!) and went to bed. They are so kind. 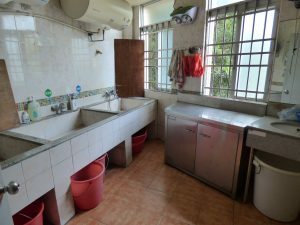 Hong Kong apartments are small – even smaller than what we usually saw in New York! But they squeezed us all in and made us feel like family. I was wide awake at 2am. Thanks, jet-lag! Then 3, then 4, then 4:15, then 4:30, and I finally just got up at 5. The trick is if we can all make it to the evening tonight, we’ll be tired enough (probably!) to actually sleep and then our bodies will be switched. This direction the jet-lag isn’t so bad. It’s really going home that seems to hit the hardest, I’m not sure why. Grace and Peter had told us their kids usually get up at 9 on a Saturday, but I guess they were as excited to see us as we were to see them, because all the kids were playing together by 6! Their poor neighbors! But they were having a blast. 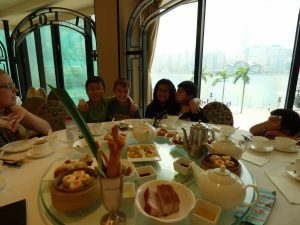 We had breakfast (watermelon, pork buns, mantou buns, toast, and tiny chicken pies) and then everyone got dressed and we headed out to see Hong Kong together! We walked through their neighborhood, starting with a beautiful walkway along the water – just stunning. Visited their market which I thought was enormous – stall after stall after stall of fresh fish and vegetables, and fruits, and Chinese medicine, and then Grace told me apologetically that they only have a small market near their house. It had to be at least 100 stalls. And the fish were literally still jumping on the table, and there were crates of live chickens looking at the newly butchered chickens hanging in the case (poor chickens!!! ), so it is definitely fresh! So interesting. We bought little custard pies straight out of the oven – the bag was literally steaming my hand while we were waiting for them to be cool enough to eat, and they were amazing. Did I mention hot? Oh. my. goodness. It’s about 95 but the heat index is 110 and 100 percent humidity. We have been more attractive at other times in our lives, just saying. 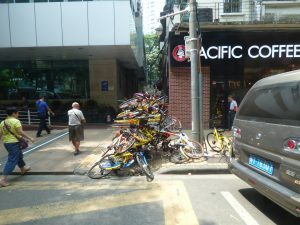 We all got out our umbrellas in true Chinese fashion just to get a little shade from the sun. It’s very sunny here, but it’s still hazy – when we look at the mountains in the distance, they are in soft focus. 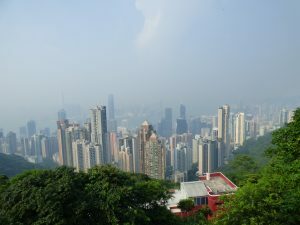 I asked if it’s ever clear (when we were here before it raining constantly and all of Victoria Peak was in a cloud), and Grace said she thought it was clear about half the time. If it ever is, it would be incredibly stunning – it really is such a beautiful city. 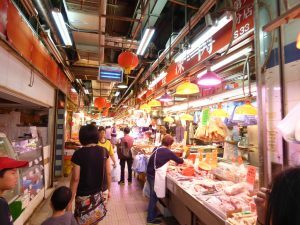 We took the subway into the central part of the city and visited the market in Mong Kok. So fun! We just like to look around. Peter bought some waffle thing that was pressed into circles, and you just tore off the pieces. 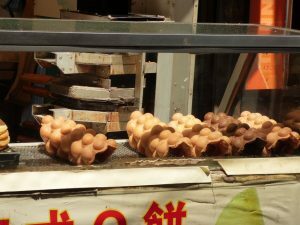 It was like a sweet waffle with a bit of coconut flavor and we were a little like locusts I’m afraid – it was gone in about 2 minutes. You’d think we’d never eaten before! But the food is one of the best things about Hong Kong. We were going to visit the Ladies Market which is a more traditional street market (Mong Kok used to be, but the government decided they all needed to be storefronts, so it’s changed) but it was too early – they were still setting up. We walked through the side of it anyway, and it’s shocking that the put up the whole thing and tear it down every day! And we saw some of the my favorite “Chinglish” translations on signs! I was sorry they weren’t open yet – I saw one I wanted to buy that said “You strong like Rambo, but you brain is potato.” But then I thought, where would I actually put that in my house? Ha! We headed down to the waterfront in Kowloon. Hong Kong has four districts, and Kowloon is the peninsula jutting into the water facing the island of Hong Kong. 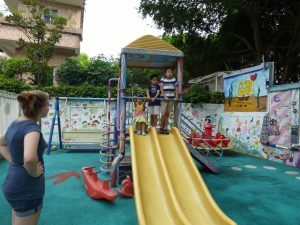 Grace and Peter live in the new development district, and when we come back to fly home after the adoptions, we are staying in the fourth district on Lantau Island near the airport. So we feel like we’ve seen a lot this time. 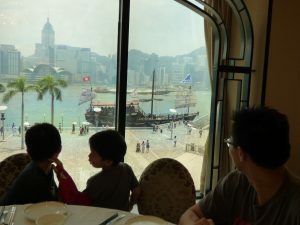 Grace had made reservations for a dim sum lunch at a restaurant literally looking at the water in Victoria Harbor facing Hong Kong. It was one of the best meals I’ve ever had, even though I didn’t always know what I was eating. Grace ordered everything and told us what was there, and the food just kept coming – I lost track. But it was one bite of everything, which is my favorite way to eat. 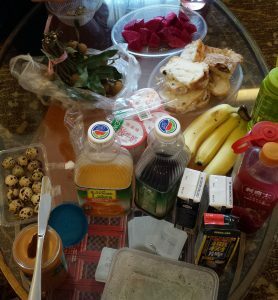 Taro and shrimp, spring rolls, barbecued pork buns, water chestnut gels, radish cakes, rice wrapped peanut pork, shrimp and pork dumpling, chicken zhong zhi, squid shaped red bean buns (super cute! ), and about a hundred other things. Then they brought out the chicken feet. I had told Grace before that we liked most things, but since we’re American, we are generally a little wimpy about weird meats. I used chicken feet as my example, as in, “I loved everything we had last time, but please don’t make me eat chicken feet.” Well, Noah took this as a challenge. 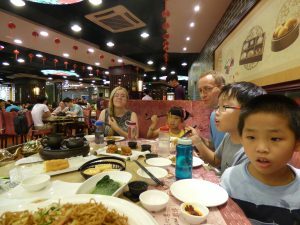 Told me how amazing they were, how I would love them, etc, and it turned into “mom has to try chicken feet.” Then Chung Yan joined in and we were getting out-numbered. Well, you know what? Maybe mom will. Can’t let a 10 year old win! Plus, this whole culture eats them, I can be respectful of that. And so I did. But oh my. I tried to take a little bite, and it moved, yup, just like a foot. It was exactly like biting into little tiny chicken feet bones. And I am a wimp. And I got the shivers. And pretty much everyone laughed at me, but then I was able to take a bite. Maybe the tiniest one ever, but a bite nonetheless. The flavor was actually really good, but I am not a convert. No, ma’am. And then Toby did it and Rinnah did too (apparently Nathan’s claiming a pass because he tried them once in Mexico and says that counts! ), so that’s most Shaws down – check that off the bucket list, I guess! But a certain someone can never again say I wouldn’t do it! After lunch we took the ferry across to Hong Kong and headed up to Victoria Peak to get the view! We missed this last year because it was raining so hard we couldn’t see anything. Even though it was hot, like surface-of-the-sun hot, we still had such a good time doing this. And I got a much better concept of the island itself. It’s amazingly steep, and you wind your way up and up and up. And so many people. I love visiting cities but only for short times – I start to feel very claustrophobic after a while with all those people touching you everywhere you go. Like everything else in cities with large populations, it always takes longer than you think it will to get anywhere, and by this time it was late afternoon and all the kids were dragging. The adults were too! So we headed back down and took the bus home. This time we sat on the top of the double decker bus, and that was fun to watch! It was about 45 minutes home. I think where Grace and Peter is is one of the loveliest places I’ve seen, but she said they live “far out” because Hong Kong is so expensive. It costs 1 million USD to buy a 400 square foot apartment! So they trade the commute for lower rents. Grace stopped at the market to get a few things and Peter took us all for bubble tea. It was heavenly after being so hot! Then we walked the 10 minutes back to the apartment. Grace told me she was making a “very simple meal” and wouldn’t let me help, but after that very busy day she made beautiful beef and scallions, a potato dish, and a soup with chicken and cabbage and rice noodles and served it all over rice. They really just went overboard to make us feel welcome, and we felt so blessed. It was wonderful to spend time with them, to have this special day in Hong Kong, and to have such a lovely way to distract ourselves from the last few days of waiting to be with our new kids! By 7 I could barely keep my eyes open (thanks, again, jet-lag!) but I made it to nearly 10 and then crashed. I slept 8 whole hours in a row – something I haven’t done for a month! It was beautiful. Up bright and early at 6 with everyone else, and we got packed up and ready to go. The kids played some more and we had a beautiful breakfast together (sorry, this is all about food, but it was wonderful!). Red dragon fruit, longan fruit which they call “dragon eye,” scrambled eggs with ham, and different buns from the bakery – croissant, “pineapple bread” which isn’t actually pineapple flavored but looks a bit like one, hot dogs buns (like a giant pig in a blanket) and some pizza buns. Then they got ready for church and walked us back to the subway with all our stuff. We took the first train together and then split up where we needed to change. 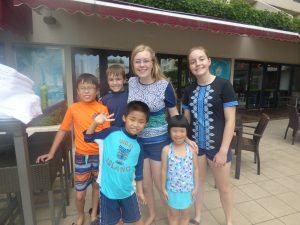 I got teary when we said goodbye – they were so kind to us! 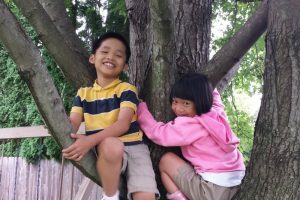 And Noah and Chung Yin, Chung Yan’s younger brother, were like best friends by the time we left, and sat with their heads together everywhere they went. I wish they were still in our neighborhood! But they are coming for a visit next spring, so I’m hoping we will see them again then. Then we were on our own again. Hong Kong is much easier to navigate than mainland China for us because many things are labeled in English as well. Even with that, though, it still takes longer to figure things out. We did finally find the train station and figure out where we were to be, and we were actually early enough that we got on an earlier train. When we get in, we’ll be met by our guide for our time in Guangzhou, Helen. The plan today is just to check into the hotel, figure out our rooms (we have a bit of a complication with so many of us) and get settled before we get the new kids tomorrow. It’s our last day as a family of 6, and that has hit me all day long. Every time we are walking or changing trains or buying tickets, I’m counting and counting that we have six. And tomorrow, it will turn into 8.